What follows is a text of a presentation given to the Annual Meeting of the American Association of Geographers in New York, 26 February 2012. A subsequent, much briefer piece, set in the context of impending changes to NSW’s planning laws, was published by The Conversation. 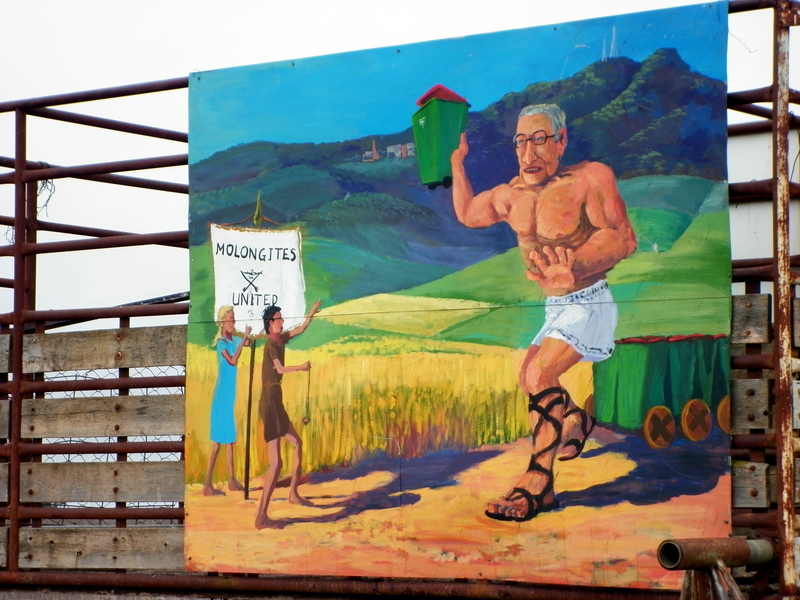 I want to speak to you about a landfill, composting and recycling facility that was proposed, assessed and – after legal and political twists and turns – was approved for development in the small town of Molong, located 4 hours drive west of Sydney. The proponent of the development was Orange City Council. Molong is about 25 kilometres beyond the boundary of the Orange City Council local government area. With the benefit of David Delaney’s work on ‘nomoscapes’, I will look at how within the controversy over the Orange Waste Project law and place were connected. The geography was categorised by the law. The law specified that developments in New South Wales could be with respect to the ‘state’, could be ‘regional’ or ‘local’. Meanwhile, the law had to confront details about the agricultural quality of the land, the sense of place, the threat to amenity, and the importance of the rural landscape: all matters familiar to geographers. What I hope to achieve is to not only introduce you to the project and the particularities of the nomospheric method I found most useful, but also to offer an analysis of the decision-making throughout the assessment process for the project, looking at the important local and regional dimensions and suggesting that in this instance the project was approved because one actor – the Minister for Planning – had unfettered power in and over the nomosphere: including power to define the nomosphere itself. Delaney’s recent scholarly contribution argues that the places and environments that we inquire about can be understood further and differently by ‘thinking about the complex, shifting and always interpretable blendings of words, worlds and happenings … through which our lives are always unfolding’. Undertaking so-called ‘nomospheric investigations’ into events that encounter the law can offer more detailed and critical perspectives about the law and the world in which we live. Central to these investigations is a focus on ‘situations’, not on ‘cases’; on experiences, viewpoints and the dynamics of power, not so much on the legal outcome. Delaney makes the point that the lived experience of the law is frequently neglected. The typical legal analysis analyses the text of a case. For this work, however, the case: Hub Action Group v Minister for Planning (2008) 161 LGERA 136 will represent a milestone in a much longer history; as one moment when the nomosphere was disturbed. As situations unfold they are assessed by participants. One dimension of assessment or judgment is the degree to which what is happening is seen as comporting with notions of fairness or justice. Actors assess not only what does, can or is likely to happen, but what should happen or shouldn’t happen, should or shouldn’t be happening. In this project there were two competing nomic settings: the ‘regional’ (encompassing the surrounds of the provincial city of Orange) and the ‘local’ (the town of Molong) within the ‘nomoscape’ of the Orange Waste Project. These settings are typically, and in this situation were, defined not only by the law, but by understandings of geography and history. They are changeable and were changed. Participants in the controversy advanced arguments and justified their actions by reference to these settings. The project and the conflict that it created has some of the hallmarks of a typical environmental justice controversy. It ended up a battle between a large provincial and historically wealthy city with an increasingly diverse economy and a small country village largely reliant on agriculture for its ongoing prosperity. Orange is, within the Australian context, a relatively large inland city with a population approaching 40,000. It is a vibrant city whose growth, like a number of historic inland cities in Australia, was triggered by the gold rush in the mid to late 1800s and whose reputation and attraction is sustained today by its successful marketing of gourmet food and wine tourism. 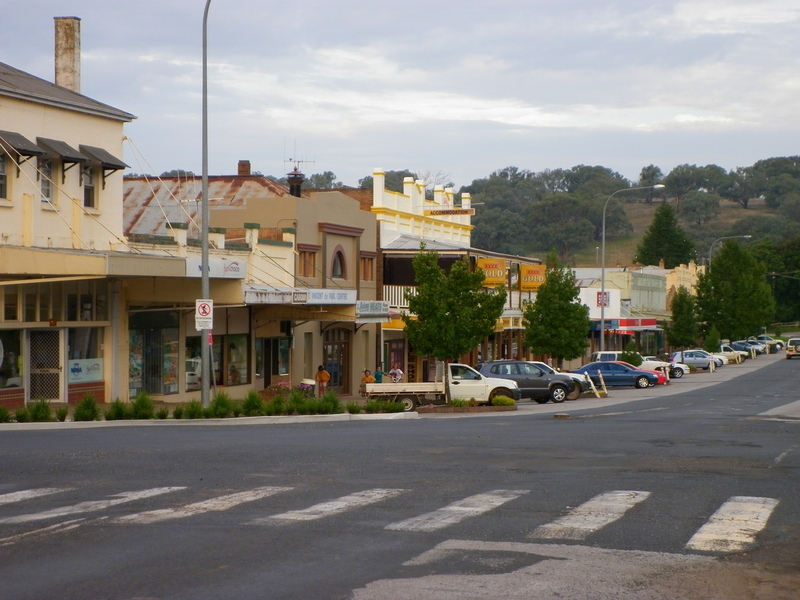 Molong is a small country village with a population of a little over 2,100 people. In terms of population it is less than 1/16th the size of Orange. On most socio-economic indicators Orange is only slightly better off. The differences are, by and large, historical and cultural – reflecting how the places came to be as they are and how they are viewed by their residents and others. Turning now to what I have conceived as the nomoscape of the investigation. The Orange Waste Project had its origins in 1996, when the Orange City Council and Cabonne Shire Council first met to discuss a joint waste project. By 2000 the councils had agreed to find a site to build a facility that would service both municipalities: 90% of waste coming from the City of Orange and 10% of waste originating in Cabonne Shire. 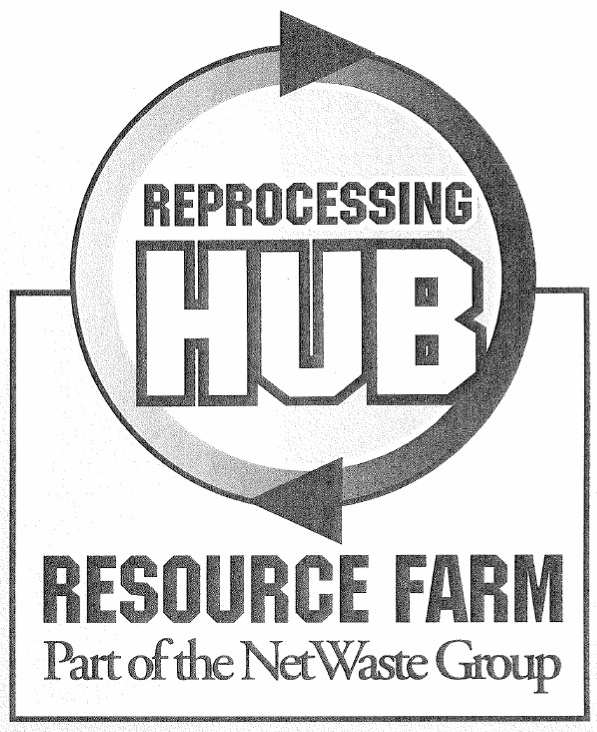 The councils imagined a ‘Reprocessing Hub Resource Farm’: a tip, with a waste recovery facility – including recycling and composting components. In a highly controversial manner at the end of a site selection process Orange City Council purchased land in Molong and then announced that it would be the site of the Hub development, breaching commitments that it had made to to acquire a site with community consent and after alternatives had been ventilated. 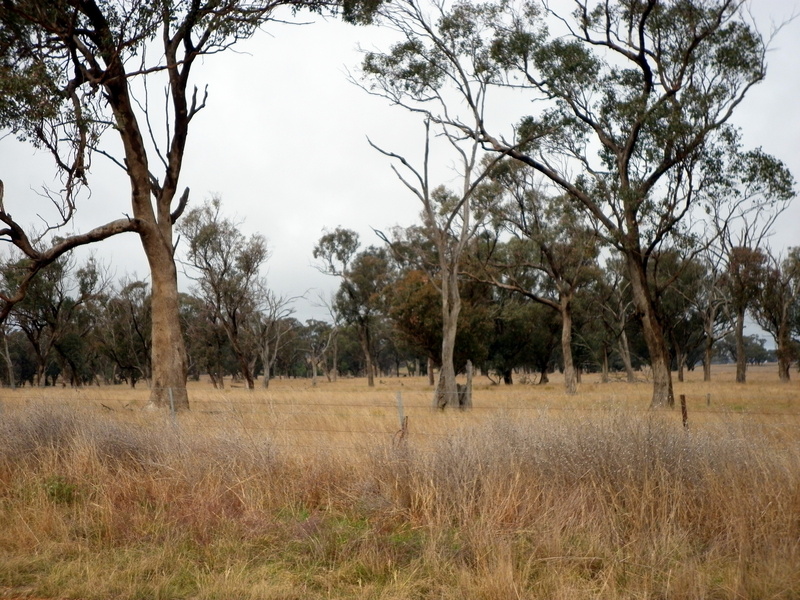 The purchased land was a farming property on Euchareena Road 5 km from the Molong town centre. The land remained the site for the development despite opposition initiated by nearby farmers that subsequently spread across the Molong community and despite planning impediments, and even after the Cabonne Shire withdrew from the project. The Hub Action Group, formed by landholders nearby the Euchareena Rd site, led the opposition to the project. The project did not immediately inspire broad opposition, however. The local paper reported a general disinterest from the community at about the time the first environmental assessment was released in 2005. There appeared to be apathy in the media in the early stages, with muted support and minimal critique. Still, 139 submissions objecting to the project were made with respect to the first environmental assessment. localised to the site: It was the wrong site. It lacked the necessary environmental strategies and planning support, with the Cabonne Local Environment Plan 1991 protecting the prime agricultural land of the site from adverse impacts. localised the Molong community: who would suffer amenity impacts, especially from trucks driving to and from the site through Molong’s town centre. 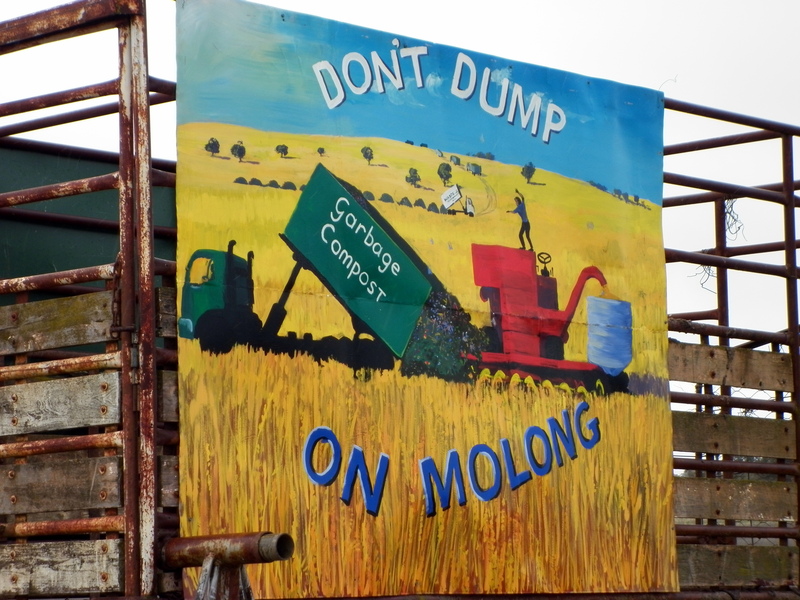 Overarching these perceived impacts was a sense that this project would deliver to Molong a destiny that it did not want – the status of being its neighbour’s waste dump. and is satisfied that the development will not have an adverse effect on the long term use, for sustained agricultural production, of any prime crop and pasture land. The Minister approved the project after undertaking the required assessment and finding that the site was prime crop and pasture land, and that there would be adverse effects on the long-term use of the land. The Hub Action Group initiated a merits appeal to the NSW Land and Environment Court. In that setting, the project was rejected because of its likely current local impacts and those that would be felt into the future. The judge also concluded that the project was fundamentally unsustainable because it was not apparent how the recycling and composting components would be developed or supported by local systems. It was the first significant nomic disturbance of the project. [The] development compromises future generations’ ability to use and enjoy to the same degree as the present generation the prime crop and agricultural land. Its project rejected, and its partner, Cabonne Shire Council, no longer supporting the project, Orange City Council opted to take an alternative route to an approval that would side-step the court’s finding and alter the scale for the assessment of the project. This was a further and determiniative nomic disturbance for the project. In early 2009 it applied for approval under Part 3A of the NSW Environmental Planning and Assessment Act 1979. This part of the Act was introduced in 2005, shortly after the first project environmental assessment was initiated by Orange City Council. It was introduced with a clear and deliberate intention of facilitating state-significant or regionally-significant developments. It did this by consolidating decision-making power in the hands of the Minister for Planning and his/her Department, providing immense decision-making discretion – including being able to ignore local policy – and created tremendous barriers to bringing an appeal against a decision of the Minister. It was at this point that the opposition to the project was at its greatest. Orange City Council was accused of acting unfairly, undemocratically, and contemptuously of the court and the public. It was able to employ a process that had resulted in 6 of 442 applications being rejected over a 4-year period. OCC intend to lodge a “Part 3A application” with the NSW Department of Planning. Under this planning provision the Minister can deem the proposal “state significant” and rubber stamp the HUB proposal on prime agricultural land …. And no one, not even our Courts, can stop him. The “back door” route. Moreover, the community’s justice discourse was no longer only grounded in distribution but also in procedure. The community presented their renewed battle as a David and Goliath one. Under the law and supporting policy, a ‘regional’ landfill of the size proposed by Orange City Council was a ‘regionally significant’ development that could be assessed under Part 3A. The Minister for Planning had the power to declare that a project was a ‘regional’ landfill, if in his/her opinion it was a ‘regional’ one. A strong critique could be made of the finding by the Minister that the landfill was a regional one – based on legal statutory interpretation principles or on common or geographic understandings or what a ‘region’ is. However, there was a very fragile basis for challenging that decision, even though this particular matter was highly contested. It portrays itself to be a regional solution. It is not. It is not supported by any other regional LGA and is opposed by the host Council, Cabonne. It has been ‘dressed up’ as a regional landfill for the purposes of Part 3A qualification. But in substance it is not. a responsibility to act in the best interests of the community to provide long-term regional waste management strategies … This proposal will deliver waste management solutions for the region well into the second half of this century. In its third environmental assessment for the project the proponent indicated that there would be an opportunity for other councils to direct their recyclables and green waste to its facility, and they expected this opportunity to be taken up as the State’s waste minimisation strategies demanded further efforts to reduce volume of non-recoverable waste. The Planning Assessment Commission, in its advice to the Minister made its evaluation on the basis that the project would be for the ‘region’ and not just Orange City Council. It was not restricted by, or had to comply with, clause 10(1) of the Local Environment Plan. [T]he [environmental assessment] has satisfactorily considered the impact of the Project on the agricultural capability of the Euchareena Rd site and adjoining land and is taking the necessary measures to mitigate and manage this. In making this judgement, the PAC takes into consideration the agricultural capability of the Region, not just the site in question. Residents of Molong are unlikely to see the greater environmental outcomes of the Project and may argue that there is no improvement in their amenity or convenience. … [Nevertheless,] the public interest is best served by the Orange region achieving a sustainable solution to waste management, with minimal impact on people in the region, businesses and the environment. This was most apparent in the way the Commission framed the ‘public interest’ at the regional scale, and how the Commission acknowledged but discarded local impacts. With such a strongly worded recommendation the project was approved subject to modifications that would make it one of the most technical and highly conditioned landfills in NSW; and a project that would be endorsed by former project doubters from the waste industry and environmental movement. So what can we take away from this story other than a further impression of the troubles with a law that has recently been repealed by a Parliament led by a new State Government of NSW? In this case we can see how the law responds to nomic scales, how it can prioritise one over others, and moreover how it can devise and define nomospheres. Law and geography can be firmly linked. We can also see how the law can allocate and privilege actors within particular nomospheres, and can exclude judges and lawyers altogether from the nomosphere – vesting legal as well as administrative function in an often obliging government. The consolidation of unfettered power in this case created a type of spiral, where the most powerful actor in a nomoscape was able to employ that power to more narrowly define a nomosphere where that actor’s power was further increased. Finally, the situation here is another example of local interest and concern being overwhelmed by other scales in planning and environmental assessment matters. This may be warranted depending on the importance and critical nature of a proposal. However, what is most worrisome here, and perhaps would be uncovered with similar critical inquiries into other projects, is that there was a very challengable foundation for departing from the local scale as the basis for project assessment but no real ability to challenge it.